Still have a few choice things that you would like to say about AutoCAD even after the newest release of 2006? Maybe you have one of the best ideas and you are waiting for it to be added to a future release. Both of these are valid reasons that you might want to think about getting involved in the beta programs that Autodesk puts together around each release of its software. Don't have lots of time to spare? That's Ok... you give what time you can. Each person that participates in the beta programs have different reasons for being part of it. Some just want to get ahead start on learning the ins and outs of the migration process so they have a small learning curve once the final product ships. Some really get heavily involved with the software because they have a passion for technology and for the products that they use on a daily basis. So will you be part of AutoCAD 2007 (or whatever the next version is called) before it ships? Autodesk values feedback from its customers, both good and bad alike. So get involved today with surveys, usability studies and beta testing. It is also a great way to network with others in the industry as well, I have met many great people through this experience. Sign up at the My Feedback Portal by clicking this link. AutoCAD Drawing Thumbnails with Shading? 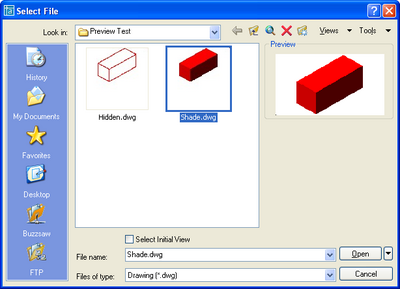 Starting with AutoCAD 2005 you could use the Shademode command to set how the thumbnail was generated when you previewed the drawing in one of the dialog boxes that supported a Preview window. Some of these dialog boxes include, but not limited to Open and Save. This is a great extra touch when using Windows Explorer or Design Center to drag 'n drop blocks into a drawing. The Preview window only functions this way with AutoCAD 2005 or higher. If you were to view the same drawing in the Preview window in an earlier version of AutoCAD it wouldn't display shaded. Can't Get Enough AutoCAD Information? CADopolis has created a site with links to many of the blogs that are focused around AutoCAD. Many of the links are to some of the sites that I read on a regular basis to get a perspective of what is going on in the industry and to pick up some helpful hints. Rrrrrr... with a knock on the door it was the FedEx guy with a package. Kudos to Autodesk for including some of these small, but helpful items with the subscription program.